In a way I've done my own research, trying different things with my son. I feel that my experience is valuable to researchers. 9 in 10 autistic people and families say that they would take part in research, but many don't know where to start. We set up the Discover network to make it easier to get involved. Here we answer your questions about Discover. 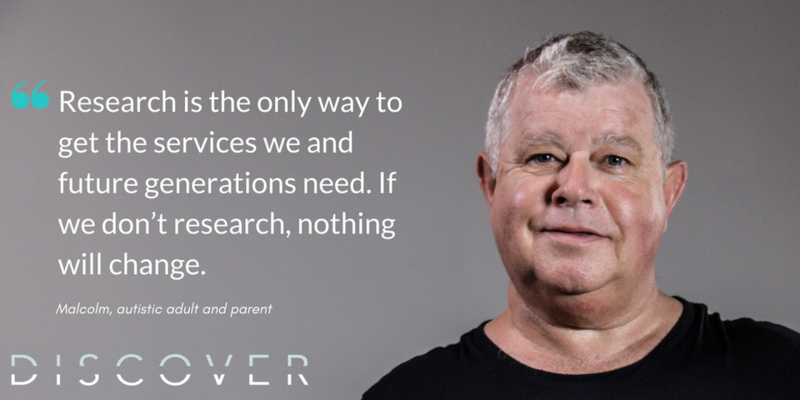 Discover is a virtual, online network run by Autistica. It links autism research centres with autistic people, their families and carers. Charities, schools and care providers can also be members. Why should I join Discover and get involved in research? As an autistic person, family member or carer, you are the true autism experts. We need you to share your experiences, tell us what research matters to you and try new tools and therapies. If more people take part in research, we can make faster progress and develop the services and treatments that you need. If I join the Discover network, what research will I be involved with? We will send you opportunities to take part in studies being run by us and our partners. These will all be based around the autism community's top priorities such as mental health, language and communication and physical health. What should I expect from the research? Will it involve medication or people in white coats? Most research doesn’t happen in a laboratory. You may also be able play an active role in the development of some research. It could be as simple as getting involved in a survey or advisory group and there is a lot of research that can be done from the comfort of your own home. Other research can be more involved - trialling a new therapy or app for example. As a member do I have to take part in research? No, you can register to just receive updates from us if you prefer. If you do want to hear about research opportunities, you will not be automatically enrolled in research. What happens if I see a study that I want to take part in? If we send you an email about a study and you'd like to get involved, you can respond to the research team directly. They will give you further information and you can decide whether to go ahead. You can always opt out of studies at any stage. Who can join the Discover network? Is it for adults and children? We urgently need autistic people of all ages and abilities, along with their families, carers and friends. If you have a child with autism, or are caring for someone with learning difficulties, you can sign up on their behalf. I am a friend or carer but not a relative, can I join Discover? Yes, it is appropriate for you to join Discover. We need insights from everyone who has a personal experience of autism. How will my information be used? Will it be kept confidential? Your personal details will be housed confidentially and securely. All we ask for is your name, email address and your connection to autism. Only if you are interested in participating, will the research team ask you to provide further information. How will I know if the research is appropriate or ethical? All research will be approved by an independent ethics committee before any research project can commence. You would be fully informed about what the research involves before being asked to participate. What are the goals of the Discover network? Involve the autism community to ensure you have your say in autism research and ensure what gets funded is what matters most to you. Support you and your family: The Discover Network is intended for the whole community to learn more about autism research and how you can be involved. Work and share together: coordinate research initiatives to maximise efforts and promote greater collaboration between the autism community and researchers. Bring experts together to develop a national autism research strategy, increase collaboration between the research community and ensure the UK becomes a world leader in research. Grow future leaders: investing in the next generation of research leaders in autism, including members of the community. How many people are currently involved in the Discover network? Several hundred people have joined Discover. We aim to have 5,000 members by the end of 2017 and 20,000 by 2021. How can I join Discover? Joining Discover is very straightforward. Autistic people of all ages and abilities, together with their families or carers, are invited to join Discover. Complete the form at the bottom of this page. If you have more questions about Discover, email Abi at discover@autistica.org.uk or call 020 3857 4340. Your experience of autism is unique and your voice is valued. We want everyone with an experience of autism to join Discover. Together we can change the future of autism.